World soccer's governing body (FIFA) has raised concerns with the Israeli government after the IDF targeted the main soccer stadium in the Gaza Strip with artillery fire. 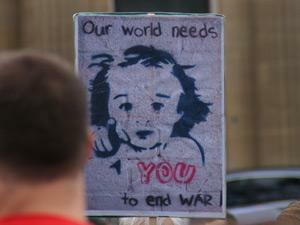 FIFA said Friday it is considering possible action over the air strike. The shells, which reportedly left a large crater in the center of the field, were fired early last Friday morning in response to Kassam rocket attacks. 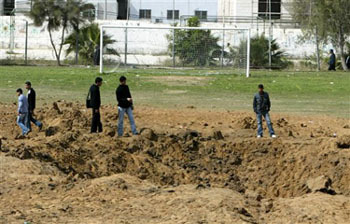 Those attacks included one rocket that landed on a soccer field at Kibbutz Karmiya, south of Ashkelon, the day before. The IDF has acknowledged that the stadium was specifically targeted to "send a strong message to the Palestinian people against terrorism." Jerome Champagne, FIFA representative for special affairs, said FIFA was "not happy with what happened.. Hitting a football stadium is absolutely counter productive for peace..". Champagne added that the field was not being used by Palestinians as a missile launching pad, as Israeli Ambassador to Switzerland Aviv Shironhad originally claimed. He further added that Israeli checkpoints have made it impossible for the Palestinians to develop their own league..
"Knowing the stadium was unpopulated, artillery fire from Israel was fired directly at it," said the IDF Spokesman. "The terrorism is coming from within them, and they need to know that they are the ones suffering." The fire took place at a time when the Palestinian national soccer team is taking part in the Asian Football Confederation (AFC) Challenge Cup in Bangladesh. Jerome Champagne, a representative of FIFA's president for special affairs, this week sent an official letter to Israeli Ambassador to Switzerland Aviv Shiron, asking him to explain why the stadium was targeted before FIFA decided what action, if any, to take. Champagne told The Jerusalem Post that the organization was "not happy with what happened." "Hitting a football stadium is absolutely counterproductive for peace, because today football is the only universal tool that can bridge gaps," he said. Champagne added that the field was not being used by Palestinians as a missile launching pad, as Shiron had originally claimed. The former FIFA deputy general-secretary said that Israeli checkpoints have made it impossible for the Palestinians to develop their own league since 2000, and he refused to condemn the Kassam attack on Karmiya. Citing the 2004 FIFA decision to allow Israel to host its national team games on home soil after being forced to play abroad for two years due to terrorism fears, Champagne said, "We did everything possible to make sure the Israeli team has the right to play. At the same time, we have to observe the situation [in which] Palestinian football cannot be developed itself because of Israeli checkpoints." When asked about the threat of Kassams, Champagne, a French national, said, "The Gaza Strip was occupied since 1967. [France was] occupied by Germany three times in the last 100 years. Do you think we could just kiss and make up after six months?" 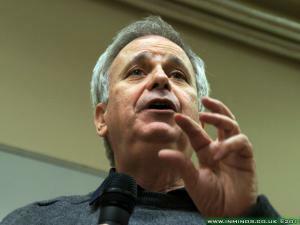 "No part of Israel is occupied by the Palestinian people. 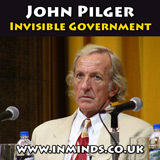 It is not right to occupy a people," he added. Shiron said that after he received the letter he discussed the issue with FIFA representatives. "I checked with the authorities in Israel, and I got back to them [FIFA] saying that in the framework of Israeli activities against Kassam rockets and its launchers apparently the field was hit." Shiron said he also raised with FIFA the issue of the Kassam that hit the soccer field in Karmiya, but that FIFA had not yet responded. Uri Selah, secretary of Kibbutz Karmiya, said one resident sustained light wounds in the attack, although it could have been much worse. "It is a small field, but if the rockets had been fired a day later it would have been full of people playing soccer and the situation could have been much more serious," he said. AFC President Muhammad Bin Hammam condemned the Israeli strike as "a crime against Palestine sports facilities" and held a meeting with Palestine Football Association assistant general-secretary Nahid al-Hour to discuss the situation. FIFA president Sepp Blatter, in Bangladesh to observe the tournament, also attended the meeting and is expected to discuss with Champagne on his return Friday what, if any, action FIFA will take. 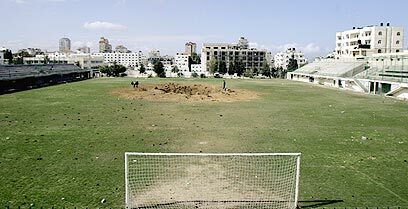 FIFA will pay for repairs to a soccer field in the Gaza Strip that was damaged in a bombing during an IDF offensive earlier this month. FIFA decided to pay for repairs on the stadium after it deemed the direct strike was "without any reason" and that the soccer field was not being used by Palestinians as a missile launching pad, as Israel's ambassador to Switzerland had originally claimed. "In the world of today, which is disrupted by long-lasting disputes and violence, football is one of the very few universal tools mankind can use to bridge gaps between nations and peoples, and to symbolize what unites our planet over what divides it," FIFA president Sepp Blatter said Tuesday. FIFA said it was not yet sure how much the repairs would cost. World soccer's governing body said with the help of the Palestinian FA, it would evaluate over the next few days the extent of the damage done to the open-air stadium and its stands. Much would depend on whether the drainage system was badly damaged. "FIFA's role is not to reprimand, but to help create bonds and ensure that the young people of the region have hope and the possibility to enjoy the school of life that football represents," Blatter said. "Therefore, I call on the relevant authorities to do everything they can to allow Palestinian and Israeli football to develop." FIFA stressed that it supported Palestinian and Israeli football equally. While UEFA banned Israeli clubs and the national team from playing international competitions at home between October 2001 and April 2004 because of a series of terrorist attacks, FIFA ensured that Tel Aviv hosted the Israeli national team's qualifying matches for the 2006 World Cup. 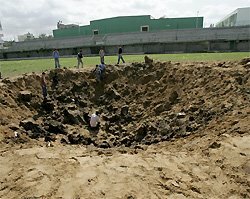 No casualties were reported in the April 1 air strike, which reportedly left a large crater in the field. The Israeli military said there had not been any rocket fire from the soccer field, but that the air strike was part of an effort to deter possible attacks after an increase in rocket launches from Gaza. On 15th Feb 2019, Inminds Human Rights Group protested outside Puma's London flagship store to demand Puma stop its complicity in Israel's war crimes by it sponsorship of apartheid Israel Football Association, which includes football clubs based in illegal Israeli settlements. On 6th Oct 2018, Inminds protested outside Puma's flagship store on Carnaby Street to demand Puma stop its sponsorship of apartheid Israel Football Association, which includes football clubs based in illegal Israeli settlements. 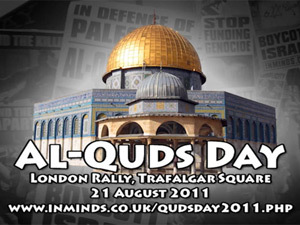 The protest was violently attacked by zionists. On 6th Oct 2018, Inminds will protest outside Puma's flagship store on Carnaby Street to demand Puma stop its sponsorship of apartheid Israel Football Association (IFA) which includes football clubs based in illegal settlements built on stolen Palestinian land. On 30th March 2018, Inminds human rights group protested outside Adidas's flagship store on Oxford Street to demand Adidas respect Palestinian human rights by stopping its sponsorship of apartheid Israel Football Association which includes football clubs based in illegal Israeli settlements built on stolen Palestinian land. On 30th March 2018, Inminds will protest outside Adidas's flagship store on Oxford Street to demand Adidas stop its sponsorship of apartheid Israel Football Association (IFA) which includes football clubs based in illegal settlements built on stolen Palestinian land. Join protest outside the Maccabi Tel Aviv vs Chelsea FC football match to demand apartheid be kicked out of football. Following on the successful sporting boycott against South African apartheid, Israeli apartheid should similarly be boycotted and Israeli teams excluded from international sporting arenas like UEFA and FIFA. 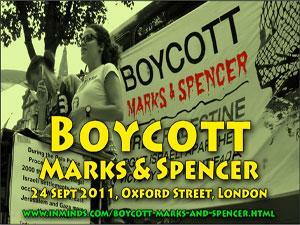 Mahmoud Sarsak - Racism and politics in sport: What about the Palestinians? Video of panel discussion (17 June 2013, SOAS) on the impact of politics and racism in football and the role of sport as a means for Palestinians to resist occupation, featuring Mahmoud Sarsak. Palestinian footballer Mahmoud Sarsak who was abducted, tortured and caged for 3 years by Israel before winning his freedom through a 96 day hunger strike, gave a talk in London on 26th May 2013 - full video with QA session. 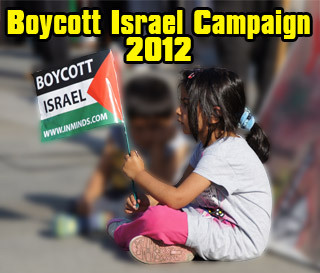 On 24th May 2013 activists will march on the UEFA Annual Congress to demand UEFA not hold the European Under-21 championships in Israel this June, and kick apartheid Israel out of UEFA and demand the immediate release of the Palestinian footballers Mohammed Sadi Nimer and Omar Abu Roweis.. If you agree with our work then please support us. 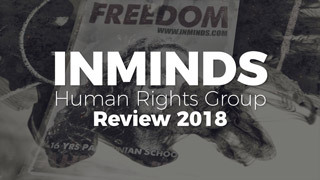 Inminds Human Rights Group carried out over 35 actions in 2018.. Palestine.. Bahrain.. Nigeria.. Saudi.. 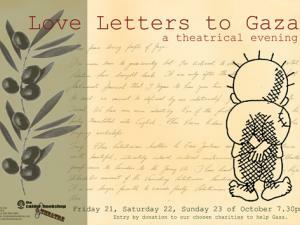 Comic - A story about an arms peddler, a butcher, and a people yearning for freedom..
A unique theatrical event using personal messages of love, support and hope from people of all ages and all walks of life to the people of Gaza. 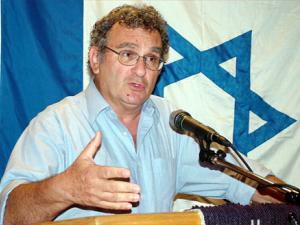 Activists oppose visit of racist Israeli historian Benny Morris who justifies ethnic cleansing and genocide. Are you financing Israels brutal occupation this Ramadan? "For most journalists, whether they realize it or not, are groomed to be tribunes of an ideology that regards itself as non-ideological, that presents itself as the natural center, the very fulcrum of modern life. This may very well be the most powerful and dangerous ideology we have ever known because it is open-ended. This is liberalism." The opinions expressed on this site, unless otherwise stated, are those of the authors. All logos & trademarks are the property of their respective owners and their use is covered under 'fair use' policy. Copyright © 1998-2012 Innovative Minds www.inminds.com All Rights Reserved.